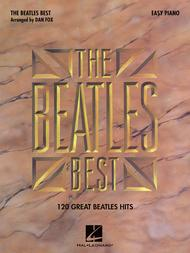 Beatles Best - Easy Piano by The Beatles. For Piano/Keyboard. Easy Piano Personality. Classic Rock, Britpop and Psychedelic Rock. Difficulty: easy. Songbook. Vocal melody, piano accompaniment, lyrics and chord names. 368 pages. Published by Hal Leonard (HL.364092).ISBN 1423422465. With vocal melody, piano accompaniment, lyrics and chord names. Classic Rock, Britpop and Psychedelic Rock. 9x12 inches.Arrangements of more than 120 of the Beatles greatest hits. A truly remarkable collection.